I felt my heart halt. The perfectly rendered hound captures the poet’s imagination—even as Walcott tells Pissarro’s story, the hound is a recurring presence, a reference point throughout the book. Though Walcott searches for it his entire life, he is unable to find the painting again—a symbol of Walcott’s unfulfillment as a painter. and questioned resurrection; its seven bright bands. confirming their ascent to paradise. 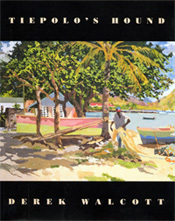 The book reproduces 26 full-color paintings by Walcott, which serve as points of reference while Pissarro lives in Paris. 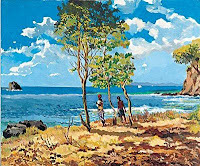 The watercolor and oil works, painted by Walcott between 1982 and 1999, mostly depict scenes from the Caribbean—beach scenes of boats and swimmers and rocks and waves, open fields, horses, churches, men playing music or dominos. The paintings are awash with pastel colors, and tropical blues, greens, and pinks. It's a palette that reappears consistently in the poetry, colors and images that never fully escape the poet.